DOG v CAT BATTLE – ROUND TWO RESULTS ARE IN! THE RESULTS ARE IN! In case you haven’t noticed, the Angels Bark and Jingle Jangle Jungle blogs are in the middle of a battle tournament of epic proportions. This tournament will may provide answer to a long-time battle between cat-lovers and dog-lovers. Who’s at the top: the dog or the cat? I just tallied the votes. And this was an exciting battle, especially at first as both songs were running neck and neck. But Marvin Gaye pulled ahead and kept on going, coming out the winner. Lobo with “Me and You and a Dog Named Boo” received 4 votes. Marvin Gaye with “I’ll Be Doggone” received 7 votes. Marvin Gaye’s “I’ll Be Doggone” is the Round Two Winner. So what’s next in this epic battle? ROUND THREE will pit the Round One’s HARD ROCK DOG against Round Two’s SOFT ROCK DOG. Thanks for your participation and your votes. 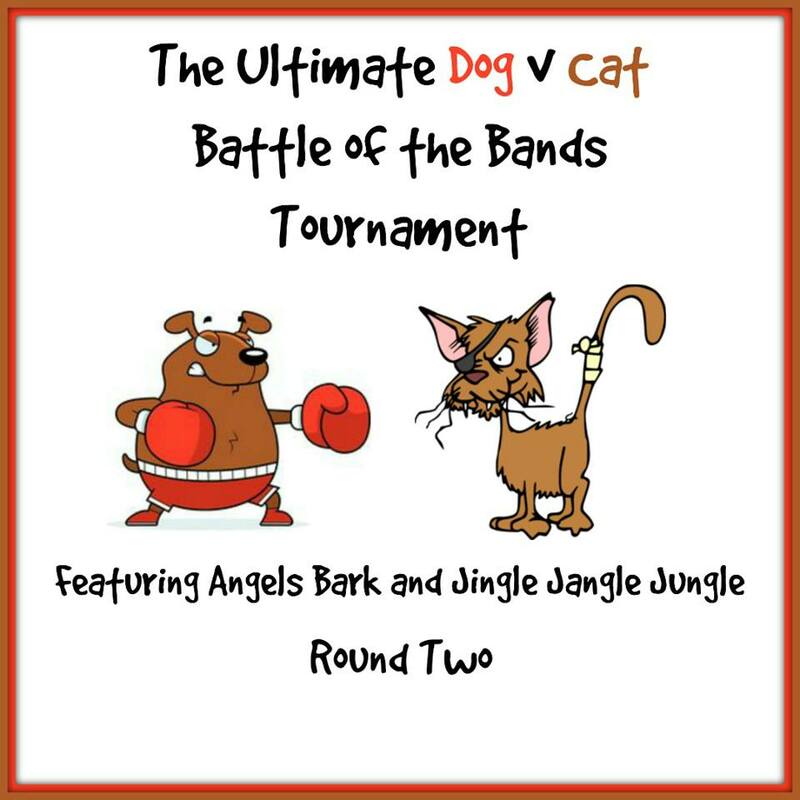 Ultimate Dog v Cat Battle of the Bands Tournament! Since we won’t be seeing Lobo in Round Three, I’m going to leave you with another Lobo hit from the 70s. Here’s “I’d Love You to Want Me”, Lobo’s highest charting hit from 1972. It hit #2 on the Billboard Hot 100 and stayed there for two weeks (it was kept from the top spot by Johnny Nash’s “I Can See Clearly Now”, another favorite of mine). See you in 5 days for Round Three! This entry was posted in Stories and tagged Battle of the Bands results, BOTB, Lobo, Marvin Gaye, music, The Ultimate Dog vs Cat Battle of the Bands Tournament by greyzoned/angelsbark. Bookmark the permalink. Whew! Almost time for the big face off! I was going to give my results in my Monday post, but I think I’m going to hold out for Wednesday and keep it a somewhat surprise. And… I was thinking of you when I put together my Monday post (the one for the 13th) I figured you would want to do Dog Songs for the Dog Days of Summer, so I am going with an alternative (non-cat). See you then! if not before…. I may join in Song Lyric Sunday again. I’m relieved to see you, dear friend. Thanks for reporting the final vote tally of your latest dog fight. Although your ears didn’t match mine this time I agree that the two contenders are both great songs. I am happy to see that the vote distribution was fairly even. Your follow-up Lobo song “I’d Love You to Want Me” along with your mention of Johnny Nash’s “I Can See Clearly Now ” recall that period in the early 70s when soft rock ruled the airwaves but hard rock, arena rock and pop metal hair bands were beginning to assert themselves and disco was waiting in the wings to become a dominate force in music the rest of the decade. I hope you, your mother and your hounds are doing well this week, dear friend Michele. Have a safe and happy weekend! Pretty decisive victory! I like this Lobo song a bit more than the one featured in the battle. As for the next round, for sure the hard rock tune gets my vote. 😉 Have a good weekend! Yikes, I missed your last BoTB! How did that happen? *scratch head* I’m soooo sorry! I think had I played along I would’ve gone with “Me and Dog Named Boo”, too. It’s been a long time since I’ve heard this song. What a fun song!